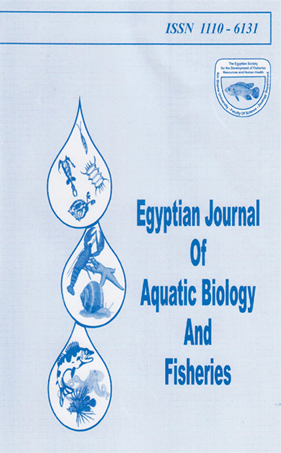 This study aimed to investigate the fishery biology of Terapon puta, family Teraponidae,caught during 2016 with bottom trawlers from east Egyptian Mediterranean waters at Damietta and Port Said. The total number of fish studied at the present study was 506, ranged from 6-14 cm, total length. Length-weight relationship was determined for males (logw = -1.3122 + 2.333 log L), females (logw=-1.70195+2.7238 logL), immature (logW=-2. 10597+3.0806 log L) and for total fish (log w=-2.0763+3.0557 log L). Condition factor for females (k=1.023) was higher than that for males (k=0.997). Age was estimated from length frequency data by Bhattacharya’s method (1967) Von Bertalanffy growth parameters were L∞=15.9 cm, K=0.3614 y-1, t0=0.6313 y-1 and w∞=39.27 gm. The individuals of this species live for about 3 years and the second age dominate the population. the growth performance index in length (φ2=4.3643). Estimated total, natural, fishing mortality rates and exploitation rate were (z=1.0374 y-1, M=0.9797 y-1, F=0.0577 y-1 and E=0.3797 respectively).